During the 2014-2016, Ebola epidemic, the Centers for Disease Control and Prevention (CDC) deployed Border Health Teams to Guinea, Liberia, and Sierra Leone. These Border Health Teams provided technical assistance to airport staff, in implementing exit screening of travelers, helped seaports develop their response plans, and traveled to land borders by car, like the one pictured here, or helicopter, to assess screening procedures at border crossings. 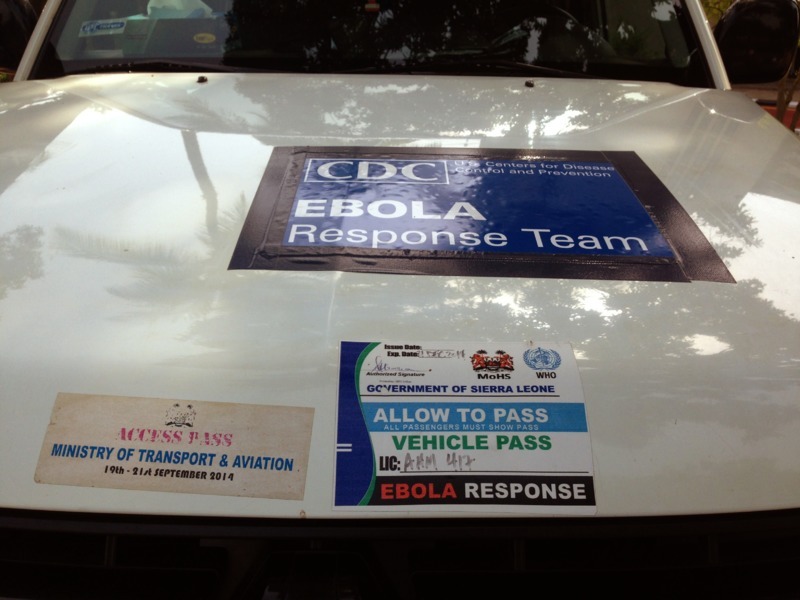 Displayed on this vehicle, were the CDC, and Sierra Leone government stickers, which would allow CDC staff, passage through several checkpoints on the way to airports, seaports, and land borders. Rebecca Myers, “Ebola Response Team,” The Global Health Chronicles, accessed April 22, 2019, https://globalhealthchronicles.org/items/show/7753.